(CNN) -- Steely Dan, Faith Hill, Eminem and U2 each took home three Grammy Awards on Wednesday night as the Recording Academy honored the best in music. 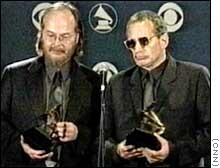 What do you think of Steely Dan winning Album of the Year? I'm happy. It's a great album. Figures. The Grammys always play it safe. I don't care. I haven't followed the Grammys since they awarded it to Toto. Which artist won eight Grammy awards and three Latin Grammy Awards last year? Steely Dan, the band that enjoyed 1970s success and made a comeback in 2000 with "Two Against Nature," won the evening's top honor -- best album -- along with best pop performance by a duo or group with vocal, and best pop vocal album. "This is a great honor for our fans and us," said band member Walter Becker. U2 won song of the year, record of the year and best rock performance by duo or group with vocal, all for its hit song "Beautiful Day." "The whole year has been quite humbling," said Bono, lead singer of the band. Hill won female country vocal performance, country collaboration with vocals (with husband Tim McGraw), and best country album. "Wow! I cannot believe this," she said. Hill thanked her family, including McGraw, and her two daughters. "They bring so much joy into my life, much more than I thought I could hold in my heart," she said. A total of 100 categories -- a new high for The Recording Academy -- were honored Wednesday, including a new category for Native American music. The ceremony, televised on CBS, was hosted by Jon Stewart of Comedy Central's "The Daily Show." Eminem, the controversial rapper who dominated headlines with his raps that bash gays and women, won best rap album and best rap solo performance for his album "The Marshall Mathers LP." Eminem was also given a Grammy for work performed on a Dr. Dre record. The rapper also entertained the audience with his hit song "Stan" with Elton John -- who is gay -- singing backup. The rendition earned a standing ovation from the audience as Eminem and John hugged. It followed protests by gay and women's rights advocates outside the event at the Staples Center in Los Angeles. "What should I say first?" Eminem asked following his win for best rap album. "I guess first of all I want to thank everybody who looked past the controversy to see the album for what it was and what it isn't." Country star Shelby Lynne won best new artist from the Recording Academy. She's been in the business for more than a dozen years, but broke from Epic Records to create her 2000 release "I Am Shelby Lynne." "Thirteen years and six albums to get here," said Lynne, 32. "I'd like to thank my parents for always stressing, be an individual. And I stand here tonight and represent nothing but music." Other awards went to Macy Gray for best female pop performance for her song "I Try," Radiohead for best alternative music album for "Kid A," and Destiny's Child for best R&B duo or group with vocal. "We are so excited," said Beyonce Knowles, the lead singer of Destiny's Child, which also won best R&B song. "I can't believe we're winning a Grammy." The night started off with a performance by Madonna. Sporting a blonde bob and trim black outfit, the pop music legend entered the stage in a glitzed-out limo, climbed out and performed her hit song "Music," which is nominated for record of the year. Behind her, a video collage of her career dating to 1983 flashed on large screens. U2, Destiny's Child, Christina Aguilera, Dolly Parton, and Moby with Jill Scott were some of the artists who performed at the Staples Center ceremony. In the hours leading up to the ceremony, and in the opening monologue by Stewart, Eminem was the topic of discussion. "There's tremendous amount of controversy here tonight. I think we have to deal with it. I met Eminem backstage and he's really gay. About the gayest guy you'd ever meet," Stewart quipped at the beginning of the night. It was the controversy that CBS used to hold viewers. Eminem and John didn't perform until near the end of the telecast. They were introduced by The Recording Academy's president/CEO Michael Greene, who spoke about tolerance and diversity in the music arts. "We can't edit out the art that makes us uncomfortable, what our parents tried to do with Elvis, the Rolling Stones and the Beatles." Before the event, artists weighed in on the rapper. "Just by his being here, Eminem has already contradicted himself," said singer-songwriter Kenny Loggins, referring to an Eminem lyric "You think I give a damn about a Grammy?" The line is uttered by the rapper in the Grammy-winning tune "The Real Slim Shady." Loggins, nominated this year for best musical album for children, says the fuss surrounding Eminem is nothing new. "Rock 'n' roll has always been shocking people," he said. "Sometimes the job of art is to shock people. Eminem is just carrying on a tradition." The pre-show was also the site of a fashion free-for-all. From the conservative black ski cap and sweatshirt worn by Durst to the sporty suits and colorful 'dos worn by boy band 'N Sync, to the royal blue western suit and white stetson donned by Brad Paisley the music world showed its colors. Some winners announced before the ceremony: Sheryl Crow won best female rock vocal performance for "There Goes the Neighborhood." Lenny Kravitz won best male rock vocal performance for "Again." Baha Men won best dance recording for "Who Let the Dogs Out." And Joe Jackson won for best pop instrumental album. B.B. King won two Grammys -- best pop collaboration with vocals, and best traditional blues album.